Email us to tell us about your cruise to Mauritius and we'll send you a travel voucher to reduce the cost of your next cruise. This is a popular cruise, and fills up fast. Most cruises to Mauritius will allow passengers at least one full day to explore the island of Mauritius, with some allowing two sun-filled days of island exploration to the passengers lucky enough to experience one of these cruises. The ship will dock at Port Louis, the capital of Mauritius, and from here you can prepare to spend the day relaxing on the famous sandy, palm tree lined beaches that this paradise island boasts. One of the best and most well known beaches on the island of Mauritius is Grand Bay, which is a seaside resort surrounded by a stunning turquoise lagoon. If being a beach bum becomes too much, head to the Central Market for some shopping bargains instead. Shoppers can buy some great souvenirs and clothing at this market as well as marvel at the exotic fruits and vegetables on offer. Cruises to Mauritius take place in December and February, which are 2 of the warmest and most humid months (temperatures typically vary from 22 to 32 degrees). There's year-round rainfall, but February and March Mauritius typically have the highest rainfall. Do I need a passport to go on a cruise to Mauritius? - Yes, all passengers will need a valid passport to go on a cruise to Mauritius. The passport must be valid for at least six months after the date that you depart from Mauritius. Do I need to organise a visa to go to Mauritius? - South African passport holders do not require a visa to visit Mauritius. 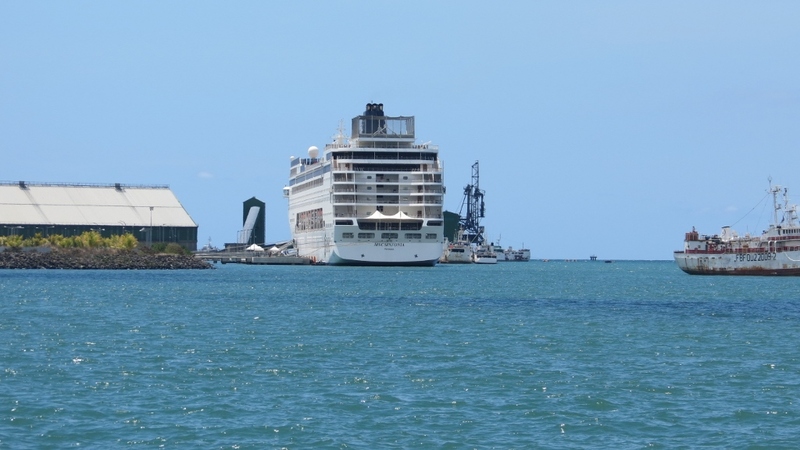 A new cruise terminal and a pier for cruises only are being built at Port Louis, and they're expected to be completed mid-2020. There are big plans afoot, as it will be able to accommodate 4000 people. If you know you are prone to motion sickness, when booking, ask to be placed in the middle of the ship (and lower down) as there is considerably less motion. Start taking your anti-nausea tablets the day before your cruise (Avomine, Stergerone and Valoid are apparently all very good). 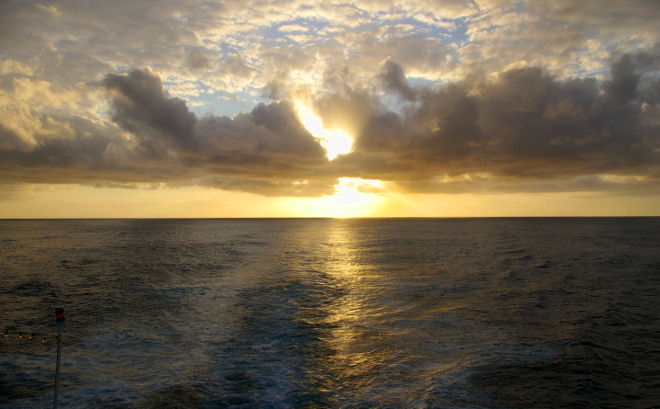 If you do get seasick onboard, don't give into the temptation to curl up and feel sorry for yourself in your cabin, rather go to the outside deck to catch some fresh air and look at the horizon to help your body regain some bearings. According to other passengers, Appletizer and swimming in the pools also help to relieve seasickness (don't drink alcohol!). If you are prone to motion sickness, AVOID the gym! Remember to pack adaptors if you need to charge any batteries, in the cabins you will find 110V and 220V two-prong plug points. Bring a small packet of washing powder in case you need to wear certain items again, although there is also a laundry service. Pack lots of sun block, after-sun, hats and sunglasses! Try to catch the evening shows as they are all of very high quality, and be there early to ensure you get good seats! Do pack at least one formal outfit for the gala evenings. It's worth getting up a little earlier to catch breakfast down at the Galaxy Restaurant. There you can order freshly prepared eggs from the kitchen (I personally loved the poached eggs done the proper way in water and then sprinkled with parmesan cheese). Dinner comes in small portions but every evening there are about eight courses to choose from. You can order something from every course or even order two main courses if you wish. You can also ask for seconds for pudding. Dieting can wait! Bring comfortable shoes for exploring the islands. Budget sparingly for service charges, drinks, excursions and shopping, not because things are expensive, but because you will want to buy everything, go everywhere and see everything! The charges onboard are reasonable, excursions organised by MSC are convenient and cater for different activities and budgets, and you can buy presents at the duty-free shops onboard where you can go mad over perfumes, cosmetics, watches, jewellery, chocolates, alcohol and tobacco products. 29 April 2013. Rating 5/5 .And there she was (now, that is if it’s ‘politically’ correct to refer to a cruise liner as a ‘she’!) As we approached the check in line after leaving our car in the capable hands of a valet service, ‘she’ became a reality to us! A reality, because just 2 weeks prior to this wonderful day, might I add, nearly mid-December, we had no idea that we would be standing at Durban harbour, waiting to board onto the MSC SINFONIA! It was the 18th of December 2012, lots of excited people around us, all, or at least most that booked this trip to Mauritius months in advance. To the date of boarding, 2 weeks, enquired, booked, paid, packed, drove to Durban and for all of you thinking. ’ye right paid an arm & a leg for booking so late I have news!!!! VERY good news! I stumbled across the SouthAfrica.TO website, made an enquiry and got the best deal of my life! More helpful & professional will be hard to find! For us our last minute booking REALLY paid off, especially if you think our adult children went with us so, that was 2 cabins thank you!!!! But now for the cruise! 10 days of doing nothing! Well…nothing except, rest, eat, relaxing by the pool, eating, watching shows in the evening, eating, shopping, eating, having fun, did I mention eating? Anyone saying that food is a challenge on the Sinfonia, doesn’t realise that all meals are included in your fare! And they really cater for all tastes & moods!! Feeling casual, you eat on deck 11, buffet or grill! Feel like doing the ‘classy’ thing, your table is ready every evening with friendly staff waiting on you! Even after paying for our drinks & a few other ‘indulges’ we didn’t break the bank at the end of our holiday!We saw the most beautiful sunrise off the coast of Madagascar, the most beautiful waves behind the ship & a few cargo ships on the horizon! No traffic jams out in the ocean! Just to have ‘been’ was medicine for our souls! 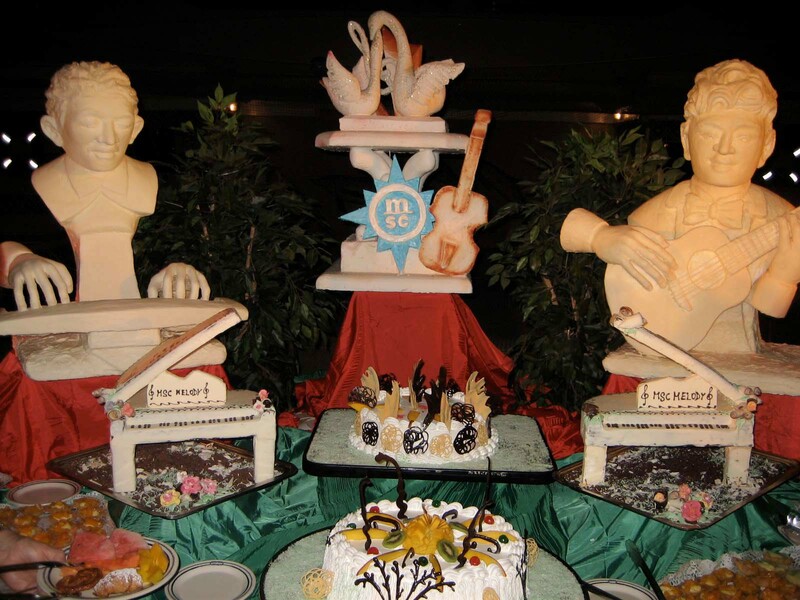 In Mauritius we, disembarked, allow me to say, such an organised ‘event’ surprised me! I mean, EVERYONE wanted to go ashore, now picture ±2000 people doing that! No hassle!! We went on a day excursion organised by MSC personnel on board just to feel our way around the area. Into a bus, out at the Pamplemousses Botanical Gardens, in the bus, out at some factory outlet stores (mmm, spending a ‘few’ Mauritian Rupees on True Religion jeans & some other ‘investments’), walking around the waterfront & perspiring (sweating sounds so unsophisticated, but really, we were sweating!) Hot & humid, Mauritius in the middle of December! The following day we went on our own island exploration! Got ourselves a taxi, with an awesome taxi driver, willing to go the extra mile for us! Showing us around & taking us to Ille Surfs. From where he dropped us we took a water taxi (motorboat) to the island. What a beautiful trip! Beautiful is the only way to explain this experience! We held on to our hats & enjoyed the ride in the clear blue water! At the island we swam in the lagoon, ate (yes again!) 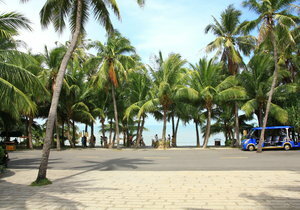 underneath a little grass ‘roofy’ (don’t know what it’s called) drank ice cold local beer & lay on the white beach sand! Reluctant to go back, but we had to, because Igbal, the taxi owner, WAS waiting for us…’take as long as you like’ he said, but ‘forever’ would have been pushing it a bit too far don’t you think? Back to the ship! Relaxing once again, fighting off a bit of sunburn, playing BINGO!! I almost forgot about the BINGO!! Did some good family bonding over a few nights of BINGO playing! No lack of competitive spirits in this family! A holiday was on the cards because it was our 25th wedding anniversary and my wife wanted something special. She eventually said that, she would love to go on a cruise. Well this was a year before our 25th and so I had a lot of time to do the planning. August came and I provisionally booked a cruise to the Portuguese islands, but then I had to go away on business for 3 months and the cruise booking fell through. I came back mid November and it was only 2 months till our anniversary. What to do now. My wife in the mean time had spoken to someone at her work who was going on a cruise and gave me the details. So this was my chance to book another cruise. I contacted the agents and got various cruise codes and booked a 12 day cruise to Madagascar, Reunion and Mauritius. WOW we were actually going on a cruise. I then booked flights to and from Johannesburg. Mid December I get an SMS and an email saying that the flight to Durban on that Sunday had been cancelled! Oh-no, what now? Luckily I managed to book another flight. The big day arrived off to the airport, on the plane and arrive in Durban to be greeted by lovely ladies in sailors outfits, carrying MSC Starlight Cruises signs. Get to the ship and book in and onboard we go. I can feel the stress that had been building up over the past couple of days just disappear. We were directed to our cabin which was very nice. Our luggage would be delivered to our cabin later in the day. Back on deck, the ships horn blew and we were off on our way out of Durban harbor. Let the party begin, this was great. The show crew put on a very entertaining dance for us and then they served lunch. What a spread they put out for us. We had decided that we were coming on the holiday to enjoy everything on the boat and not make the mealtimes a priority. 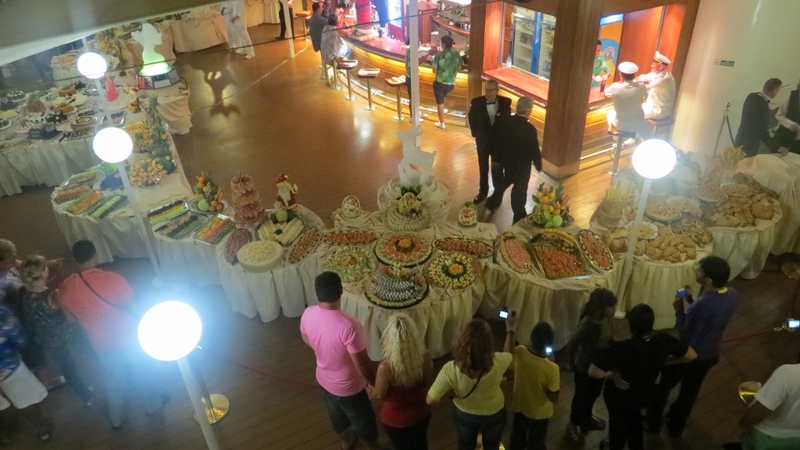 So we sampled a few items from the buffet and then went to look around the ship to see what all they had to offer. That night the sea became quite rough and I could feel it on the bed. The morning came and it was raining and the sea was covered with white horses as the tips of the swells broke. I was ok with my sea legs but my wife was down and out. Later in the day we went to the ship's doctor and he said we would have to just work it out. The next day I was up on deck and the sea had not changed. I had a bit to eat and was sitting with a couple from Johannesburg. I mentioned to them about my wife and the lady said I must fetch her and bring her up on deck. Which I did. This lady then gave her some pill and told her to eat something, by the evening my wife was feeling a lot better and that was the start to her holiday. The next day, the sea had clamed down the sun was out and the games were on, on deck. We had a day of fun in the sun and in the pool. 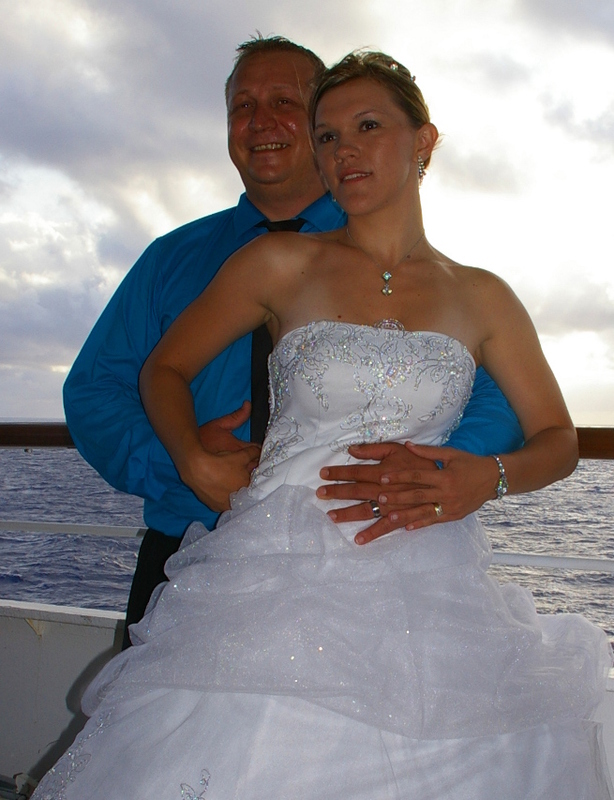 I was even roped in to being the official photographer for a couple who were having their wedding onboard. That night was the Captain's dinner in the main dining room. The dress code for the night was formal so we donned on our best and had a wonderful dinner. What a night with entertainment, we only got back to our cabin in the early hours of the morning. We arrived at the coast of Madagascar north east point at the “Isle de Marie” where we went ashore at about midday. It was so different you could see the influence the European culture had had on the small village with the buildings. We made our way to the light house which must have had a brilliant light about fifty years ago but now only had a 60watt globe in it. The sea was very warm you could spend hours in it but we only had the one day there. We went to one of the road side café/restaurants for lunch. The lobster was great at a very reasonable price. My wife really loved the place, she was also now in relax mood. That evening the ship set sail to Renunion and it was early we laid our eyes on this volcanic shaped rock in the middle of the ocean. To guide us into the harbor we had a couple of dolphin at our side that only left when we were almost in the harbor. We all went ashore and then got onto a bus to town. When we arrived we found it was a public holiday and most of the shops were closed. We walked down the road and at a take away I greeted the lady behind the counter in my broken French for directions to the bus depot. We eventually found it and got a bus going down the coast to a small town and market. We wandered around and went to the market were they were starting to pack up and were told that the market only operated in the morning. I bought a dragon fruit and my wife bought a dress. We then went to a beach pub and had a drink and I ate the dragon fruit which looked like a bright red fig and tasted good. The beach sand was black volcanic sand which was just as soft and fine as normal as we know it to be. We then took a stroll through the town to find that all the shops had closed. They were having siesta for 2 hours, wow what a life. After siesta they opened their doors for business. My wife bought a couple of hand bags at one shop which she thought were a good bargain. Then back to the ship lift anchor and into the night we sailed. The next day was Mauritius, everyone was so exited. We docked and went ashore. A couple of us hired a taxi for the day and went into Port St Louis to the local market which was very dirty and over priced. They even spoke Afrikaans to us. We then went up to Grande Bay on the north coast of the Island. My wife thought she was in paradise. The sea was a magnificent light blue very warm and no waves at all. My wife mentioned it was like a Jacuzzi. Later in the day we went to a temple and saw the various Buddha’s, then back to the harbor and onto the ship. Sailing out into the sunset with Mauritius behind us and the deep dark sea in front of us. At this stage of our holiday we were so relaxed we could carry on forever. The next two days at sea were great, we did a bit of shopping, watched movies in the theater, took part in the games on deck and went to all the shows at night. On the 12th day we saw Durban in the distance and realized that the holiday was nearly over. We disembarked and took the bus that was organized back to the airport. We were 6 hours early for our flight so we hired a car from Durban Airport for the rest of the day and went up the coast to Ballito for lunch and then drove around sight seeing. We drove back to the airport and flew back to Johannesburg. This holiday was the best a person can ask for. If you want to relax and also see some sights then a cruise holiday is the only holiday. Rating 4/5 : I had some reservations about the cruise before I got on the MSC Melody. I had done some research online and had read reviews of overseas cruises, describing the horrors of seasickness, the boredom of the endless sea, the frustrations with indifferent staff and the general grumblings of dissatisfied cruisers. In hindsight, this probably set me up for the lowest of expectations, and the fact that we found very little to complain about our cruise was an added bonus. The effects of seasickness were only mildly uncomfortable, the endless ocean was immensely romantic, the staff was mostly very accommodating and pleasant, and no matter how wonderful a place is, there will always be cringe-worthy, cantankerous customers who seem to make it a hobby of finding faults with all staff. We really had a fabulous time and enjoyed our 11 nights onboard the MSC Melody far more than we ever expected. Many people wonder what exactly do you do on a cruise ship all day. Lots actually. Or nothing at all, if you like. You can sun bathe, swim, read, nap, eat, jog, check your e-mails, take an aerobics class, take a yoga class, dance, learn to dance, learn to draw a portrait, learn to play foosball, play foosball, play ping pong, make friends, beat someone at ping pong, make new friends, play bingo, test your knowledge at a poolside quiz, shop, gamble, sip on cocktails, get a haircut, get a massage, get a manicure, gym, watch a movie, watch a cabaret show, watch the other cruisers, play board games or just choose a quiet spot and watch the world go by in a blue wonder (the ever-changing moods of the ocean is inexplicably mesmerising, much like watching the flames of a fire). We were spoiled on our cruise as we got to see three foreign islands without the hassle of visas and customs, definitely an added bonus of cruising. 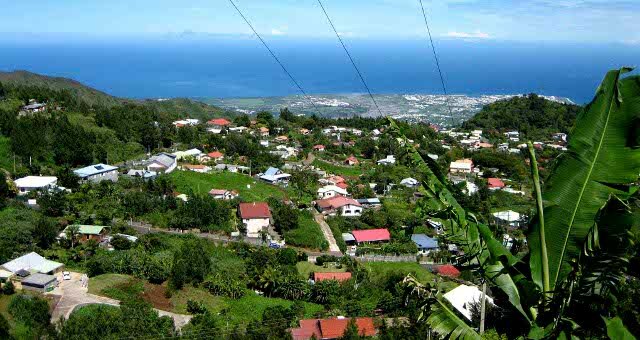 Because neither of us had ever been to Mauritius, Reunion or Madagascar, it gave us a quick glimpse into the general feel of the islands, and now we know to where we would like to return and explore more extensively. Mauritius had much more to offer than I had imagined (the Mauritius holiday ads in the travel section of the newspaper is not the best representation of the country, I discovered). We went shopping, scuba diving and wondered, wide-eyed, through the streets of Port Louis and soaked up the cultural heritage of the island. I was suitably impressed at myself for possessing a French vocabulary extending beyond Bonjour and Voulez-vous coucher avec moi, even though speaking French was rendered almost useless as in response, French-speakers generally speak too fast for comprehension. We resorted to English and sign language most of the time. Overall, it was a wonderfully rich experience, not the sterile, polished-to-perfection resort island image I had had of Mauritius. Definitely a place to go back to! Reunion is French in every sense of the word. They use Euros, ride French buses, drink Champagne, have impeccable taste and eat baguettes. They also refuse to speak English. 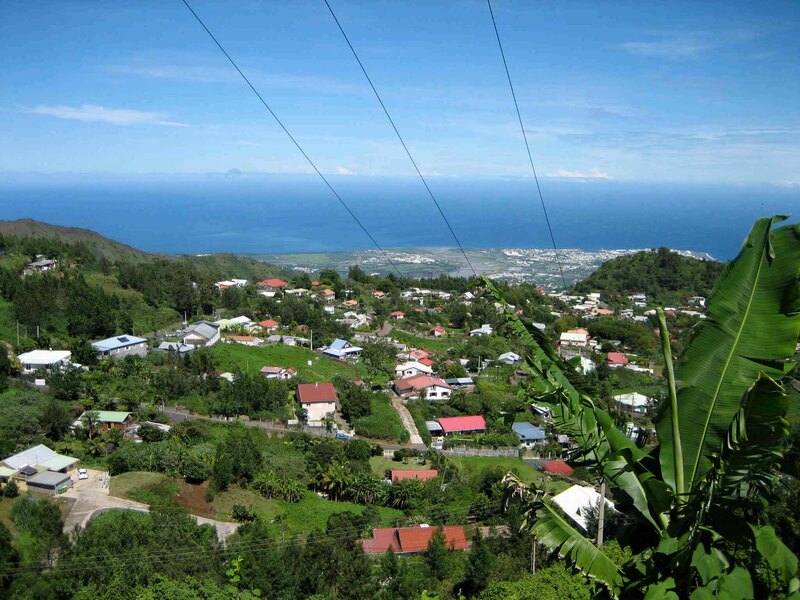 Tall, mysterious mountains cover this small island, and the black, volcanic soil allows just about anything to grow. They are famous for their volcanoes, which we did not have a chance to see as they were on the other side of the island and we only had seven hours to spare (MSC offers a seven-hour bus tour to the Piton de la Fournaise, the volcano, for US$115.00 per person, which was unfortunately a bit over our budget). We did, however, take a local bus up to Cap Noir, and then had a glorious shopping spree. According to fellow cruisers, Reunion also offers fantastic surfing and snorkelling. We left Reunion feeling a bit sorry that we didn't have more time to spend there, but sure that we would return. Madagascar, definitely the most third world of the three islands, did offer the most natural wonders. En route to the Nampoinia Reserve, we came across a bunch of boys not much older than eight years of age. One was holding a long stick with a chameleon on it. We stopped the taxi and they immediately offered us the chameleon. 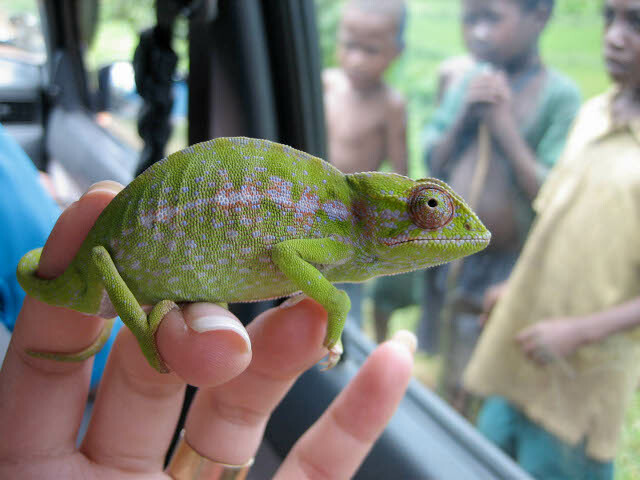 We felt sorry for the poor animal, convinced that the boys would eventually torture it to death so we offered them 5000 Ariary (about US$2.50) and took the chameleon with us to release in the reserve. When we got to the reserve, the local guide told us that the chameleon we bought was a female and won't mate now that she has been taken from her natural area. Also, despite our intentions, our offering the boys money has the negative effect of creating the idea that tourists want to buy wild animals, which will motivate them to catch more creatures to sell to tourists. So a word of advice for future visitors: Don't offer to buy any animals, even if you want to rescue them! If ever I had to imagine the Garden of Eden, I would think of the Nampoinia Reserve. There were fruit trees laden with all types of fruit, rice paddies, flowers in full bloom, trees big and small (the Giant Bamboo can grow up to a meter a day! ), and then there were the lemurs, four species in total, as well as giant tortoises, colourful lizards and frogs, the only thing missing from Madagascar are poisonous snakes. Madagascar is a beautiful place; I'm glad we got to visit the island as I don't think we would have ever chosen Madagascar as a holiday destination, it's just a pity there wasn't time to see more. The first thing everyone asked when they saw me after the cruise was the obligatory Did you enjoy the cruise? and then followed by, did you get seasick? I must admit, I was pretty weak the first three days; I walked around with a heavy head similar to a mild hangover. And this was with the help of anti-nausea tablets I hate to imagine how I would've felt without the tablets. But from the third morning I was feeling much better and felt I could take on the gym where my efforts to counteract the motions of the boat made me almost throw up on the trainer and I was back hugging the pillows in my cabin, brows furrowed as I tried to distract myself by deciphering what the announcer on the PA system was saying (my one complaint about the Melody would be the aging PA system which they must've stolen from Charlie Brown's school). There were quite a few green faces in the beginning, but soon everyone developed their sea legs and enjoyed the cruise tremendously. For this, I would recommend anyone considering a cruise to opt for a long cruise rather than a short cruise as you may spend days with a heavy head and just as it starts to clear up, be packing your bags to disembark. What a shame that would be! More than any woman I know, I love shopping. Even if you need just bath plugs or jumper cables, I will gladly spend two hours browsing the hardware store. Which brings me to shopping on my cruise holiday. Wow. Onboard the Melody there were European chocolates, perfumes and cosmetics that made me weak at the knees, and all at duty free prices. But shopping in Mauritius, Reunion and even Madagascar was just heavenly! I recommend finding a good size supermarket in Mauritius, there you will find cold meats, cheeses and wine fit for a French feast. Head to factory shops for good quality clothing and well-known labels made in Mauritius. In Reunion, we were surprised to find a big mall and it happened to be sale season. Beautiful leather shoes, French Champagnes and all things French got us swiping our credit cards for hours. In Madagascar, Fort Dauphin was regrettably small and rustic, but you will find the cheapest vanilla pods here, as well as gem stones, fossils and baskets. The market is grubby and not particularly tourist-friendly, but offers an eye-opener if for the adventurous, also you will find local baskets and textiles here. Just watch out for the pickpockets! If you have time, I recommend heading to Le Tournesol, not far from the market, for some local flavour in a clean restaurant, they have seats in the garden with views of the mountain, and there is plenty of fresh seafood on the menu! Part of the cruising experience is stuffing your face with food periodically. I was particularly excited about this because I love to eat, and I love to eat consistently. Starting at 7am, you can choose to have breakfast in the Galaxy Restaurant, or a full breakfast buffet upstairs on the Pool Deck. At 12 noon, lunch is served. Again there is a choice between the big buffet or la carte dining in the restaurant. At 4pm, tea is served with sandwiches, cakes and pastries. From 6:30pm, the first sitting for dinner is served in the Galaxy Restaurant, followed by the second sitting at 8:45pm. Dinner is a grand affair with a different menu every night, although some staple favourites are offered all the time (like spaghetti bolognaise and hamburgers). If you think that is all, don't worry, for the night owls and party animals, there is a midnight buffet that is the most lavish spread of the buffets, and usually accompanied by beautifully carved fruit and vegetables, making them feasts for the eyes too! To give you an idea of what it takes to feed over 1500 people onboard, five meals a day, here are some figures from the Food and Beverage Manager's clipboard: in one week the ship used 15,965 fresh eggs; 740 kilograms of frozen eggs; 1800 kilograms of flour; 400 litres of cooking oil; 120 litres of olive oil; 440 litres of salad oil; and nine litres of extra virgin olive oil for the tables. The food is prepared by a team of 75 Food and Beverage personnel who fire up the kitchen stoves from around 5:30am all throughout the day, until 1am, with the last shift leaving the kitchen an hour after midnight buffet is served; but snacks and drinks can be ordered from room service 24 hours a day. 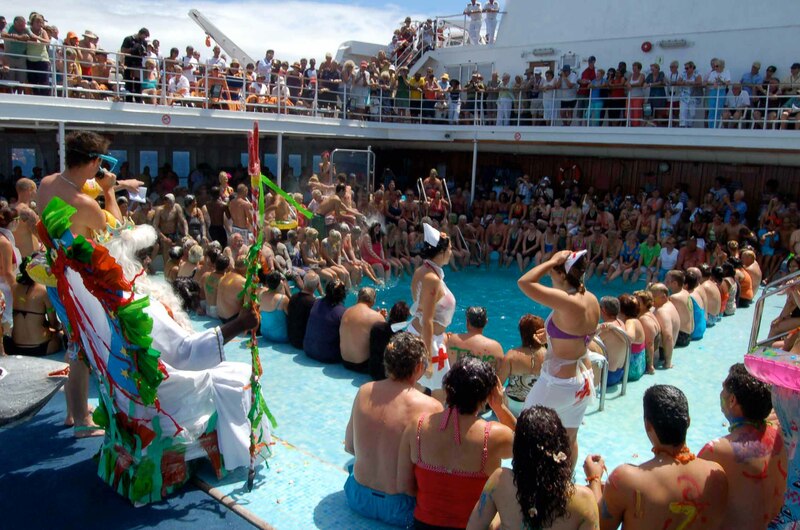 The MSC Melody has capacity to carry around 1500 passengers and 550 crew onboard (it's the second smallest of the MSC passenger fleet, after the Sinfonia), and all these people share the same public spaces for days at a time, making the spreading of germs a very serious concern. For this reason, there are hand sanitizers and washbasins all over the ship, and there are very strict procedures for cleanliness and the handling of food for the staff. Checks are carried out all the time with regards to food storage temperatures, surfaces, and contamination. During our whole cruise we never once felt that the food was unclean or old, and we didn't hear of any incidences of upset stomachs other than due to seasickness, but that's a different story. The crew onboard the MSC Melody come from all over the world, with a majority of the management from Italy (it is an Italian ship, after all), the majority of the dining room staff from Indonesia, and then the rest of the staff from Russia, Ukraine, Mumbai, South Africa, Thailand, etc. We welcomed the mix of accents as it added to the holiday atmosphere and often caused a few giggles. For some unknown reason, we were placed at a six-seater table on our own for dinner although just about every other table was full. After dinner the one evening, one of the Italian restaurant managers came over for the usual polite inquiries over supper. He pointed to the empty seats at the table and asked us, You're an animal?, My husband and I looked at each other, perplexed. He repeated again, signalling furiously at the two of us with his arms, as Italians do, and asked again slowly and clearly, YOU'RE AN ANIMAL?, while I still had no clue, my husband suddenly said with a big smile, Oh yes! Yes We're on honeymoon! Early on in the cruise, one of the managers onboard invited himself to dine with us for a casual interview. While I was fighting my hangover-like seasickness I had completely forgotten to prepare questions and ended up just having a pleasant evening chatting about tourism. Our animated Italian guest has only been on the Melody for the last few years but has been in the travel industry for decades. He has travelled extensively around the world and has dealt with tourists from all over. When asked which nation produced the most difficult tourists, he immediately whispered: America. Not surprised, I asked whether they are really that difficult. He put on a straight face, leans in and says: Difficult? They are IMPOSSIBLE! "Americans", he says, "they have a problem with everything." He mimics, "Oh, in America, they ALWAYS have water and ice available on the table." He looks at me pleadingly, "You travel to experience other cultures, if they want things done the American way, please, they have lovely big hotel chains in America. They complain about everything! They take a sip of the water" and (he scrunches up his face, puts on his best American accent) Mm, It tastes DIFFERENT. What do you say to that? It's water, but it tastes "different"?! And the silver lining: "I thank God for Americans because they have given me the best training for dealing with impossible clients. Thanks to Americans, I have patience with anyone." 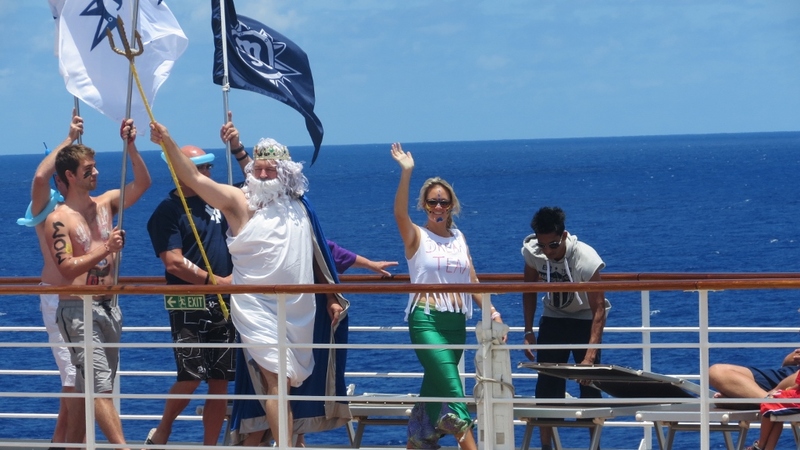 What I appreciated most onboard was the effort the crew went to make the cruise special for everyone. Yes, they do back-to-back cruises, but for us passengers, a cruise is a rare occasion and the staff understands that. From the moment you step on board, you are surrounded by an energetic, warm crew who welcome you with dancing, glasses of bubbly and the Captain's meet and greet; throughout the cruise they entertain you with live shows and music, activity classes and games; they make sure you are comfortable by straightening up your cabin twice a day and serving you in the dining room with a big smile and a joke to share; and up until the last day they create the impression that yours is the most important cruise they have ever been a part of and that you are indeed a very special passenger, they prepare a grand farewell dinner, an extended farewell show and put on a passenger talent show. I was so enamoured with the staff and their enthusiasm that I almost felt cheated on when I learnt that the next cruise was due to embark within hours of our disembarking.